Well, I’m going to define some of the most common terms that get tossed around during a session. Now, when you’re watching your friend spit his “hot” 16 on the microphone, and the engineer asks you to “grab the cans” on the wall, you will know exactly what she means! Relax if you hear this; no violence or fighting is about to ensue. It’s actually a term for recording after or into a tight audio performance. As in, “Give me a stack.” Not a money reference, no one is about to walk in with a grand in hand. 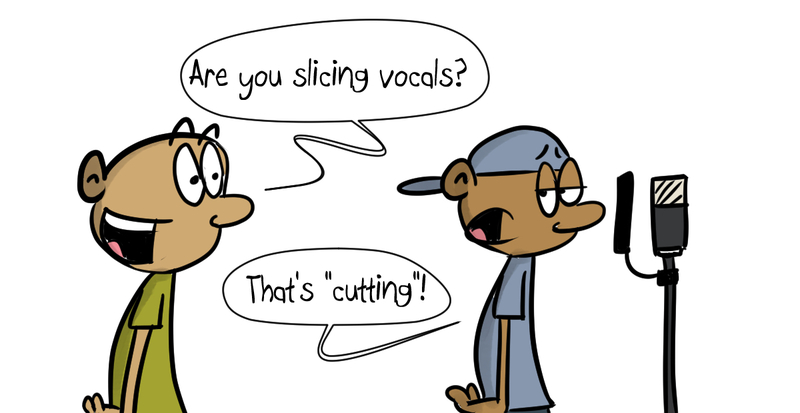 It usually means that an artist in the booth is layering a performance on top of a previously recorded one, or “stacking” the vocals on top of one another. Another term for headphones. As in, “Turn me up in the cans. Turn it up!”. As in, “The vocals are hot.” While this could very well mean that a vocal performance is really good, “hot” vocals or tracks in the studio usually mean that they are too loud, or distorting. Not a bulletproof vest, it’s the circular thingy with a mesh center that you usually see in front of microphones. This is to soften the harshness of sound made when singers or rappers use words that have the letter “p” in them.